Amnesty law on officials involved in corruption under the “dictatorship”: The opposition and several NGOs believe that the law will “encourage impunity” while Tunisia is stifled and continues to be impacted by corruption. Protests against the lack of teachers: The lack of employment is affecting the education administration. The majority of the protests this month have been related to the need of education professionals. 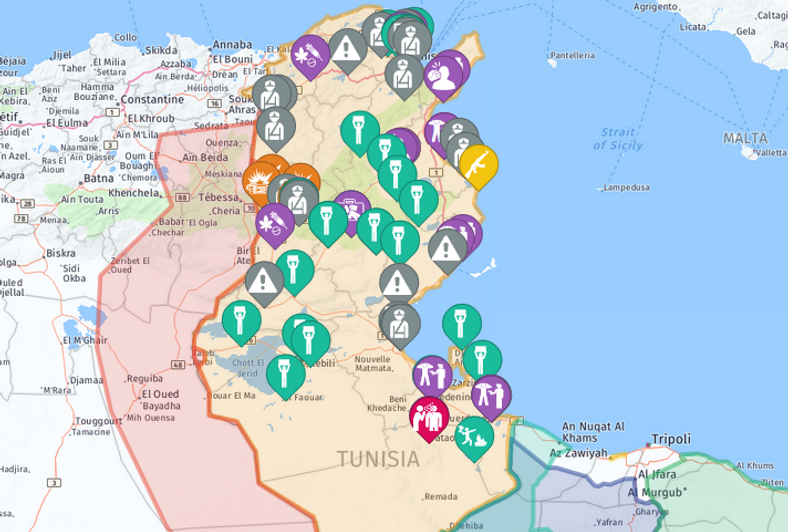 There have been some violent incidents against teachers and students in schools and universities in Medenine, Hammamet, Tozeur and Kairoura. Protest against poor conditions in infrastructure and transportation: Roads and workers conditions are affecting the infrastructure of the country and bringing social dissatisfaction in some places, such as Medenine, Manouba, Kebili, Sidi and Bouzid. Financial cooperation with the EU: There is a progress of the finalisation of the Single Support Framework 2017-2020, which consists of providing about € 1.2 billion in funding to 300 million per year related to the disbursement of macro-financial assistance. Italian-Tunisian relations: Relations of cooperation and partnership between Tunisian universities and their Italian counterparts have been established. Also projects of electrical connection between the two shores of the Mediterranean have been discussed. The military is starting to receive equipment from Germany for a mobile electronic surveillance system to be ready in 2017. This part will cover 180 km, from Ben Guerdane to Dhehiba. The Minister of Defense emphasised the importance of this monitoring system in the fight against terrorism and smuggling. 5112 million dinars to the Ministries of Interior and Defense after an increase of 4.3% of the state budget for 2018. Cyber threat: Cyber attacks have increased 82% and industrial systems are the most affected (information systems or industrial equipment). Al Qaeda, main terrorist threat: Most terrorist acts foiled by the National Guard were sponsored by the terrorist group Katibat Okba Ibn Nafaa, affiliated with the organisation of Al Qaeda in the Islamic Maghreb (AQIM). The threats coming from this terrorist group are much more numerous than those of Daesh. There are still disturbance in the drinking water supply system: Some of these problems are affecting the Southeast part of the country and to some areas with acute social needs. In the past few months there were some protests in places such as Gabes regarding the inaction to remedy the main supply system. 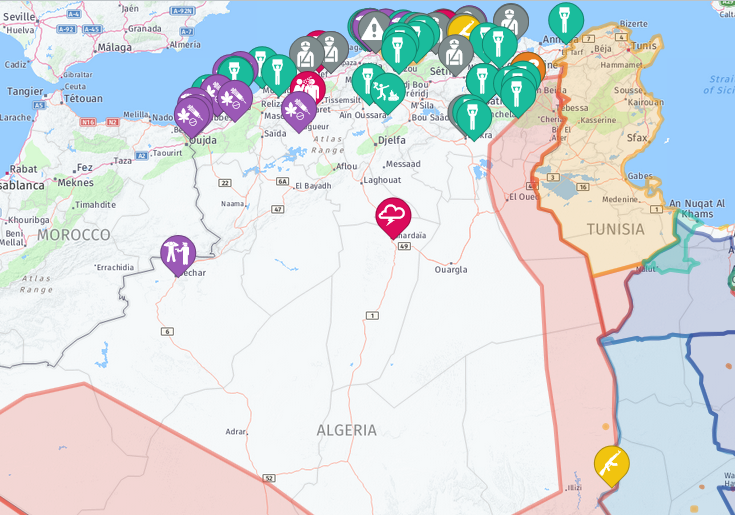 IED explosions: Some incidents have been reported in areas near to the border with Algeria and in Kasserine, where terrorist activity has been reported. Phenomenon of robberies has stopped increasing: The efforts made by the police have improved significantly, from 46% to about 60% in the year 2017 to solve this phenomenon. A large scale campaign has been launched by security forces attempting to tackle crime that affects citizens in the worst affected neighbourhoods, on public transport and around schools and hospitals. Terrorist threat decreases: 522 terrorist cases were discovered and processed by the National Guard. 694 terrorists were arrested, including two Algerians, 94 networks were dismantled and 65 people were arrested. It is mainly in Kef, Jendouba and Monts Châambi and Sammema that the terrorists operate. Lack of means in hospitals and insecurity in health facilities: Insecurity in healthcare facilities due to drug shortages, has put considerable strain on the public health system. The medical profession is also facing the shortage of medicines and other health products, sometimes engaging in “non-conforming treatment protocols”, in the absence of all the necessary means. Protests against police violence: In Algeria, police brutality is still an issue of concern because it shows the level of freedom of speech and the level of control of the state. Protests related to transportation infrastructure: Mainly in Batna, Algiers… although a national level issue with the aerial transportation carrier, Air Algeria, has brought some days of strike in the company provoking paralysis in some flights and work schedule. Social housing problem: Mainly in El Gammas, in Kais and Relizane and in the North of the country over growing demand amongst the upper and middle classes for mid-to-high-end residential property, shopping malls, quality hotels and tourist resorts. Algeria and Russia signed five partnership and cooperation agreements: These agreements mainly concern the justice (criminal field), health (a memorandum of understanding was signed in the pharmaceutical field between the private Algerian company Biomap and the Russian private company Biocad), vocational training, hydrocarbon (Memorandum of Understanding between the Sonatrach Group and the Russian company Transneft on cooperation, in particular in the field of pipeline and oil transport) and civil nuclear sectors (a Memorandum of Understanding in civil nuclear energy was signed between the Atomic Energy Commission (Comena) and the Russian company Ros-Atom). Cyber threat: 122 Algerian websites have been targeted by cyber-attacks since January 2017. In a list of 122 attacks attached to the report, it was noted that sites of the state were attacked, including the websites of the Ministry of Culture, ONEC, Mobilis, Algeria Telecom, Algeria Press Service, the Ministry of the Interior, the ANEP and even the website of Algiers airport. This shows vulnerability in the digital systems and a lack of national cyber-threat defense and response. Increase of security operations and direct attacks: Over the security need related to the terrorist threat and the insecurity in the borders of the country, the security forces have faced several security operations, especially in Jijel, Skikda, Batna, Tizi Ouzou. Algeria is on the verge of achieving self-sufficiency in agricultural products: The value of agricultural production in Algeria has risen from 500 billion DA in 2000 to 3,000 billion DA currently. The policy of good governance, decided by the President of the Republic, Abdelaziz Bouteflika, through all the programs reserved for agriculture since 2000, has nearly led to the government achieving its objective in rural development and self-sufficiency. Close cooperation with Russia: Russia is presenting itself as a great investor in economic and security development in the North of Africa after its efforts at relations with Libya, Egypt Algeria seems to be another main country for economic and security collaboration with the super power in competence with Western countries. 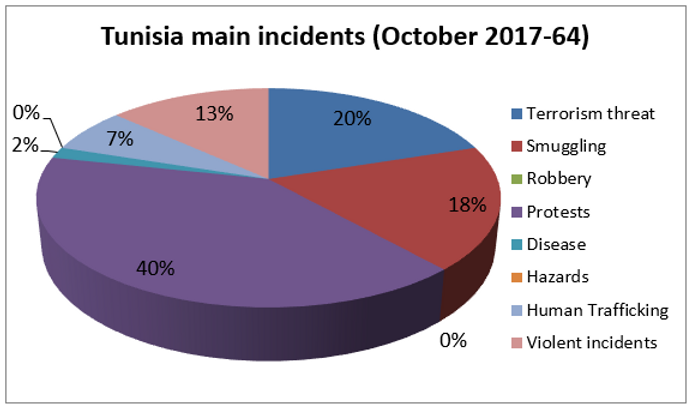 Increase of terrorist threat: Due to the security operations against terrorism and organized crime, Algerian forces have had direct encounters with terrorist elements and they have arrested main criminals related to terrorism and organized crime which has brought to justice several criminal networks. * Worrying situation: increased smuggling and violent incidents as a result of the increase of anti-terrorist operations and security devices concentrated in that matter. There is an increased concern over the bad conditions of the education and employment. Cyber threat is a growing concern also… affecting main infrastructures and companies. *Better conditions of security: Decrease of terror threat and illegal immigration thanks to the cooperation agreements with bordering countries and security improvements. Robberies have reduced from their previous levels. *Areas of destabilization: Kef, Ben Guerdane, Kasserine, Sidi Bouzid, Gabes and Sousse. *Worrying situation: increase of terrorist threat and smuggling over the deteriorating situation in the Southern border of the country and the higher number of security operations against terrorism and organized crime. 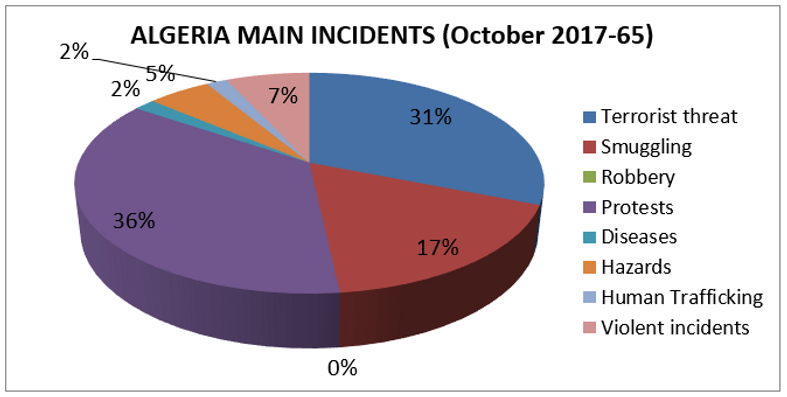 There is an increased concern over the security in health services and infrastructure. Cyber threat is a growing concern also… affecting main infrastructures and companies. *Better conditions in state response to social needs and security. *Areas of destabilization: Jijel, Skikda, Tizi Ouziz, border with Morocco, Libya and Mali-Niger.